Civil defense (civil defence), (see spelling differences) or civil protection is an effort to protect the citizens of a state (generally non-combatants) from military attack. It uses the principles of emergency operations: prevention, mitigation, preparation, response, or emergency evacuation and recovery. Programmes of this sort were initially discussed at least as early as the 1920s and were implemented in many countries, but only became widespread after the threat of nuclear weapons was realized. In some countries, civil defense is seen as a key part of "total defense". For example in Sweden, the Swedish word totalförsvar refers to the commitment of a wide range of resources of the nation to its defense - including to civil protection. Respectively, some countries (notably the Soviet Union) may have or have had military-organized civil defense units (Civil Defense Troops) as part of their armed forces or as a paramilitary service. 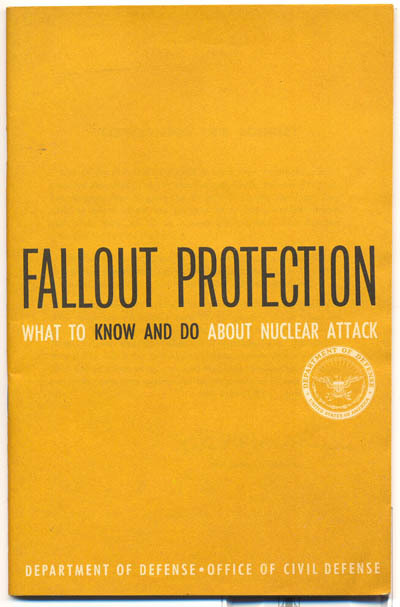 Civil Defense literature such as Fallout Protection were common during the cold war era. 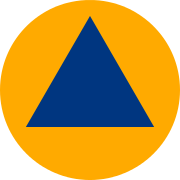 In most of the NATO states, such as the United States, the United Kingdom or Germany as well as the [then] Soviet Bloc, and especially in the neutral countries, such as Switzerland and in Sweden during the 1950s and 1960s, many civil defense practices took place to prepare for the aftermath of a nuclear war, which seemed quite likely at that time. Such efforts were opposed by the Catholic Worker Movement and by peace activists such as Ralph DiGia, on the grounds that these programs gave the public false confidence that they could survive a nuclear war. In many western countries there was never strong civil defense policies implemented because it was fundamentally at odds, and violated the West's doctrine of "mutual assured destruction" (MAD) by making provisions for survivors. It was also considered that a fully fledged total defense would have been very expensive and not worth the expense. Above all, compared to the power of destruction a defense was seen by much of the public, for whatever reason, to be fundamentally ineffective and therefore a waste of time and money. Despite evidence that detailed scientific research programmes lay behind the much-mocked government civil defence pamphlets of the 1950s and 1960s. There are not supposed to be many survivors in a belligerents country following a MAD scenario for a civil defense system to assist (thus the acronym). Governments in most Western countries, with the sole exception of Switzerland, therefore sought to mostly underfund Civil Defense but nevertheless implement effective, but commonly dismissed civil defense measures against nuclear attack, in the face of popular apathy and scepticism of authority. However the USSR military strategy during the cold war was contrary to MAD ideology, and the Soviets recognized that winning a nuclear war was possible. To this effect the Soviets planned to minimize, as far as possible, the effects of nuclear weapon strikes on its territory and therefore spent considerably more thought on civil defense preparations than in the US, with therefore, defense plans that have been assessed to be far more effective than those in the US. Civil defense has different sirens like the Federal Signal Thunderbolt siren to warn people of a coming attack. Public service announcements including children's songs were created by government institutes and then distributed and released by radio stations to educate the public in case of nuclear attack. During the Cold War, civil defense was seen largely as defending against and recovering from an attack involving nuclear weapons. After the end of the Cold War, the focus moved from defense against nuclear war to defense against a terrorist attack possibly involving chemical or biological weapons; in the context of the United States this eventually led to the replacement of the United States´ civil defense with the Federal Emergency Management Agency (FEMA). Soviet Civil Defense Troops played the main role in the massive disaster relief operation following the 1986 Chernobyl nuclear accident. Defense Troops reservists were officially mobilized (as in a case of war) from throughout the USSR to join the Chernobyl task force formed on basis of the Kiev Civil Defense Brigade. The task force performed some high-risk tasks, including manual removal of lethally-radioactive debris. After the September 11 attacks in 2001, in the United States the concept of civil defense has been revisited under the umbrella term of homeland security and all-hazards emergency management. In Europe, the triangle CD logo continues to be widely used. The old US civil defense logo was used in the FEMA logo until recently and is hinted at in the United States Civil Air Patrol logo. Created in 1939 by Charles Coiner of the N. W. Ayer Advertising Agency, it was used throughout World War II and the Cold War era. In 2006, the National Emergency Management Association—a U.S. organisation made up of state emergency managers—"officially" retired the Civil Defense triangle logo, replacing it with a stylised EM (standing for Emergency management).. The name and logo, however, continue to be used by Hawaii State Civil Defense  and Guam Homeland Security/Office of Civil Defense . The term "civil protection" is currently widely used within the European Union to refer to government-approved systems and resources tasked with protecting the non-combat population, primarily in the event of natural and technological disasters. In recent years there has been emphasis on preparedness for technological disasters resulting from terrorist attack. Within EU countries the term "crisis-management" emphasises the political and security dimension rather than measures to satisfy the immediate needs of the population. In Australia, civil defence is the responsibility of the volunteer-based State Emergency Service. In Russia, and most former Soviet countries, civil defence is the responsibility of Governmental Ministry, Like the MChS in Russia. The abolished Civil Defence Symbol survives in the Universal Prepper Patch UPP symbology of today. Relatively small investments in preparation can speed up recovery by months or years and thereby prevent millions of deaths by hunger, cold and disease. According to human capital theory in economics, a country's population is more valuable than all of the land, factories and other assets that it possesses. People rebuild a country after its destruction, and it is therefore important for the economic security of a country that it protect its people. According to psychology, it is important for people to feel like they are in control of their own destiny, and preparing for uncertainty via civil defense may help to achieve this. In the United States, the federal civil defense program was authorised by statute and ran from 1951 to 1994. Originally authorised by Public Law 920 of the 81st Congress it was repealed by Public Law 93-337 in 1994. Small portions of that statutory scheme were incorporated into the Robert T. Stafford Disaster Relief and Emergency Assistance Act (Public Law 100-707) which superseded in part, amended in part, and supplemented in part the Disaster Relief Act of 1974 (Public Law 93-288). In the portions of the civil defense statute incorporated into the Stafford Disaster Relief and Emergency Assistance Act the primary modification was to use the term "Emergency Preparedness" wherever the term "Civil Defence" previously appeared in the statutory language. An important concept initiated by President Jimmy Carter was the so-called "Crisis Relocation Program" administered as part of the federal civil defense program. That effort largely lapsed under President Ronald Reagan who discontinued the Carter initiative because of opposition from areas potentially hosting the relocated population. SEE Presidential Review Memorandum/NSC-32  (September 30, 1977) and Presidential Decision Memorandum 42 . Threats to civilians and civilian life include NBC (Nuclear, Biological, and Chemical warfare) and others, like the more modern term CBRN, Chemical Biological Radiological and Nuclear. Threat assessment involves studying each threat so that preventative measures can be built into civilian life. This would be conventional explosives. A blast shelter designed to protect only from radiation and fall-out, however, would be much more vulnerable to conventional explosives,also see fallout shelter. Shelter intended to protect against nuclear blast effects would include thick concrete and other sturdy elements which are resistant to conventional explosives. The biggest threats from a nuclear attack are effects from the blast, fires and radiation. One of the most prepared countries for a nuclear attack is Switzerland. Almost every building in Switzerland has an abri (shelter) against the initial nuclear bomb and explosion followed by the fall-out. Because of this, many people use it as a safe to protect valuables, photos, financial information and so on. Switzerland also has air-raid and nuclear-raid sirens in every village. A "radiologically enhanced weapon," or "dirty bomb" uses an explosive to spread radioactive material. This is a theoretical risk, and such weapons have not been used by terrorists. Depending on the quantity of the radioactive material, the dangers may be mainly psychological. Toxic effects can be managed by standard hazmat techniques. The threat here is primarily from disease-causing microorganisms such as bacteria and viruses. Various chemical agents are a threat such as nerve gas (VX, Sarin, and so on.). Mitigation is the process of actively preventing the war or the release of nuclear weapons. It includes policy analysis, diplomacy, political measures, nuclear disarmament and more military responses such as a National Missile Defense and air defense artillery. In the case of counter-terrorism, mitigation would include diplomacy, intelligence gathering and direct action against terrorist groups. Mitigation may also be reflected in long-term planning such as the design of the interstate highway system and the placement of military bases further away from populated areas. Preparation consists of building blast shelters, and pre-positioning information, supplies and emergency infrastructure. For example, most larger cities in the U.S. now have underground emergency operations centres that can perform civil defense coordination. FEMA also has many underground facilities located near major railheads such as the one in Denton, Texas and Mount Weather, Virginia for the same purpose. Other measures would include continuous government inventories of grain silos, the Strategic National Stockpile, the uncapping of the Strategic Petroleum Reserve, the dispersal of lorry-transportable bridges, water purification, mobile refineries, mobile de-contamination facilities, mobile general and special purpose disaster mortuary facilities such as Disaster Mortuary Operational Response Team (DMORT) and DMORT-WMD, and other aids such as temporary housing to speed civil recovery. On an individual scale, one means of preparation for exposure to nuclear fallout is to obtain potassium iodide (KI) tablets as a safety measure to protect the human thyroid gland from the uptake of dangerous radioactive iodine. Another measure is to cover the nose, mouth and eyes with a piece of cloth and sunglasses to protect against alpha particles, which are only an internal hazard. To establish a framework for effective and rapid cooperation between different civil protection services when mutual assistance is needed (police, fire service, healthcare service, public utility provider, voluntary agencies). To set up and implement training programs for intervention and coordination teams as well as assessment experts including joint courses and exchange systems. To enhance the coherence of actions undertaken at international level in the field of civil protection especially in the context of cooperation. To pool information on national civil protection capabilities, military and medical resources. To ensure efficient information sharing between the different authorities. Response consists first of warning civilians so they can enter Fallout Shelters and protect assets. Staffing a response is always full of problems in a civil defense emergency. After an attack, conventional full-time emergency services are dramatically overloaded, with conventional fire fighting response times often exceeding several days. Some capability is maintained by local and state agencies, and an emergency reserve is provided by specialised military units, especially civil affairs, Military Police, Judge Advocates and combat engineers. However, the traditional response to massed attack on civilian population centres is to maintain a mass-trained force of volunteer emergency workers. Studies in World War II showed that lightly trained (40 hours or less) civilians in organised teams can perform up to 95% of emergency activities when trained, liaised and supported by local government. In this plan, the populace rescues itself from most situations, and provides information to a central office to prioritize professional emergency services. In the 1990s, this concept was revived by the Los Angeles Fire Department to cope with civil emergencies such as earthquakes. The program was widely adopted, providing standard terms for organization. In the U.S., this is now official federal policy, and it is implemented by community emergency response teams, under the Department of Homeland Security, which certifies training programmes by local governments, and registers "certified disaster service workers" who complete such training. Recovery consists of rebuilding damaged infrastructure, buildings and production. The recovery phase is the longest and ultimately most expensive phase. Once the immediate "crisis" has passed, cooperation fades away and recovery efforts are often politicised or seen as economic opportunities. Preparation for recovery can be very helpful. If mitigating resources are dispersed before the attack, cascades of social failures can be prevented. One hedge against bridge damage in riverine cities is to subsidise a "tourist ferry" that performs scenic cruises on the river. When a bridge is down, the ferry takes up the load. Some advocates believe that government should change building codes to require autonomous buildings in order to reduce civil societies' dependence on complex, fragile networks of social services. An example of a crucial need after a general nuclear attack would be the fuel required to transport every other item for recovery. However, oil refineries are large, immobile, and probable targets. One proposal is to preposition truck-mounted fuel refineries near oil fields and bulk storage depots. Other critical infrastructure needs would include road and bridge repair, communications, electric power, food production, and potable water. The old United States civil defense logo. The triangle emphasized the 3-step Civil Defense philosophy used before the foundation of FEMA and Comprehensive Emergency Management. Civil Defense is also the name of a number of organizations around the world dedicated to protecting civilians from military attacks, as well as to providing rescue services after natural and human-made disasters alike. In a few countries such as Jordan and Singapore (see Singapore Civil Defence Force), civil defense is essentially the same organisation[Clarification needed] as the fire brigade. In most countries however, civil defense is a government-managed, volunteer-staffed organisation, separate from the fire brigade and the ambulance service. As the threat of Cold War eased, a number of such civil defense organisations have been disbanded or mothballed (as in the case of the Royal Observer Corps in the United Kingdom and the United States civil defense), while others have changed their focuses into providing rescue services after natural disasters (as for the State Emergency Service in Australia). However the ideals of Civil Defense[Clarification needed] have been brought back in the United States under FEMA's Citizen Corps and Community Emergency Response Team (CERT). In the United Kingdom the roles carried out by Civil Defence fall to voluntary groups such as RAYNET, Search and Rescue Teams and 4x4 Response. In Ireland, the Civil Defence is still very much an active organisation and is occasionally called upon for its Auxiliary Fire Service and ambulance/rescue services when emergencies such as flash flooding occur and require additional manpower. The organisation has units of trained firemen and medical responders based in key areas around the country. ↑ McReynolds, David (2008). "Ralph DiGia, 1914-2008". pp. 6. ↑ Richard Pipes (1977). "Why the Soviet Union Thinks It Could Fight and Win a Nuclear War". Commentary Reed College. http://people.reed.edu/~ahm/Courses/Reed-POL-422-2012-S1_NP/Syllabus/EReadings/05.2/05.2.Pipes1977Why-the-Soviet-Union.pdf. Retrieved September 4, 2013. ↑ Richard Pipes (1977). "Why the Soviet Union thinks it can fight and win a Nuclear War". Commentary. http://www.scribd.com/doc/63015546/Why-Russia-Thinks-It-Could-Fight-and-Win-a-Nuclear-War. Retrieved April 21, 2013. ↑ Burr, William; Savranskaya, Svetlana, eds (September 11, 2009). "Previously Classified Interviews with Former Soviet Officials Reveal U.S. Strategic Intelligence Failure Over Decades". Washington, DC. http://www.gwu.edu/~nsarchiv//nukevault/ebb285. Retrieved April 21, 2013. ↑ Captain John W. Dorough, Jr.. "Soviet Civil Defense U.S.S.R. preparations for industrial-base war survival.". Air University Review, March–April 1977. http://www.airpower.maxwell.af.mil/airchronicles/aureview/1977/mar-apr/dorough.html. Retrieved September 4, 2013..
↑ Leon Gouré Reviewed by John C. Campbell (1977). "War Survival in Soviet Strategy: USSR Civil Defense". Foreign Affairs magazine. http://www.foreignaffairs.com/articles/30948/john-c-campbell/war-survival-in-soviet-strategy-ussr-civil-defense. ↑ Richard Pipes (1977). "Why the Soviet Union Thinks It Could Fight and Win a Nuclear War". CommentaryReed College. http://people.reed.edu/~ahm/Courses/Reed-POL-422-2012-S1_NP/Syllabus/EReadings/05.2/05.2.Pipes1977Why-the-Soviet-Union.pdf. Retrieved September 4, 2013. Civil Protection (Ministry of Interior, Spain). Civil Defense Logo dies at 67, and Some Mourn its Passing, The New York Times, 1 December 2006 by David Dunlap. Cold War Era Civil Defense Museum – Features much historical information about Civil Defense history, its equipment and methods, and many historical photographs and posters. "Civil Defence" – A site with details of the UK's Civil Defence preparations, including those implemented during the Cold War such as the Burlington Central Government War HQ., at Corsham, Wiltshire.